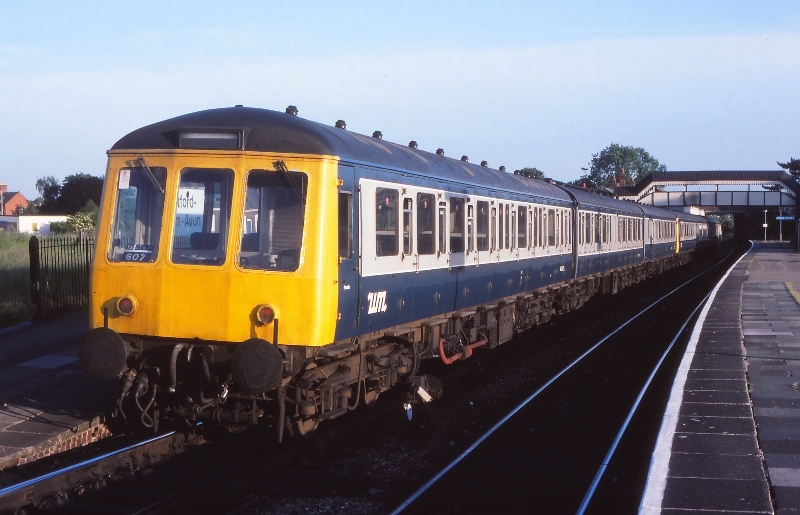 Martyn Hilbert's Railway Photography - BR Blues - Class 116 DMU at Stratford-Upon-Avon. Class 116 DMU at Stratford-Upon-Avon. On midsummers day, 21st June 1986, a pair of Tyseley allocated Class 116 3-car DMU sets, with 53872 leading, are seen at Stratford-Upon-Avon with a late evening service to Birmingham. Within a few years this familiar scene would vanish as Class 150s took over local services in the West Midlands area. In 2011, the 150s are being replaced by new Derby built Class 172 DMUs.